When the order book opens for the highly-anticipated new-generation Land Rover Defender in Australia in late 2019, customers will be taking delivery of a machine whose core competencies have changed dramatically. Like its predecessor whose lineage dates back to the 1940s, the new Land Rover Defender (codenamed L663) that will hit showrooms in 2020 will be offered in five- and three-door variants. But despite the official claim that it will be “the most off-road capable Land Rover vehicle ever”, it will be the most dynamic Defender too. 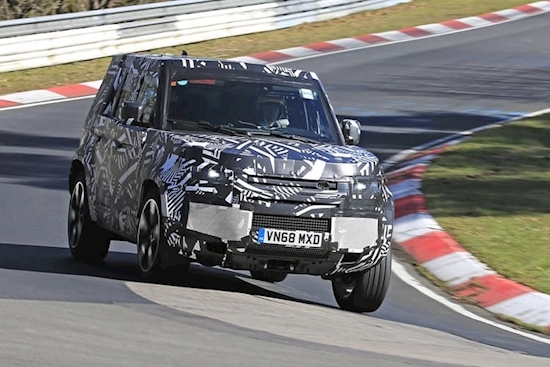 These fresh spy photos show the new 2020 Land Rover Defender having a crack at the challenging Nurburgring road course, a 20km loop comprising high-speed corners and very little run off. Riding on large five-spoke alloy wheels shod with sporty tyres that would last about half a day on the Oodnadatta track, the Defender can be seen exhibiting significant body roll. And the chances of Land Rover releasing the lap time for the new boxy-looking off-roader, the official teaser campaign for which began late last year, are about as likely as finding sentient life on Mars. Still, it will be a rare occurrence for owners to take the rugged vehicle to the racetrack and we’d wager the old Defender would be on its side at the same speed around that corner. However, the track testing signals a shift in strategy for the British brand as it attempts to broaden the Defender’s appeal. No longer based on a rugged ladder chassis frame, the new Defender will be underpinned by a more robust development of the aluminium-rich D7u monocoque platform architecture that underpins the Discovery. While off-road purists may rail against the shift to a more car-like chassis, the company says the new Defender will still set off-road benchmarks. Turbo-petrol and diesel Ingenium combustion engines will be offered along with several electrified powertrains to future-proof the vehicle. That means everything from 48-volt mild-hybrid, to more serious plug-in hybrid and even full-EV powertrains are on the cards. Leaked images of the Defender cabin show a more upmarket push and the adoption of several luxury car features, such as semi-autonomous on- and off-road driving aids, could also lead to significant price rises. It could be argued there is a golden age of sorts occurring presently, as a number of other ‘proper’ new 4WDs come through the pipeline, including the new Mercedes-Benz G-Class, Jeep Wrangler, Suzuki Jimny and in the next couple of years an all-new Toyota LandCruiser 300 Series. However, in an apparent crack at rivals like the G-Class, Jaguar Land Rover’s chief marketing officer Felix Bräutigam also appears to be tempering people’s expectations of the new Defender. “The one thing I can promise you is that the new Defender will do all that our customers expect of it, without being a copycat of what has gone before,” he said at the Paris motor show late last year. The new Defender will bring more luxury, more car-like on-road behaviour and possibly even a pick-up body style in addition to the short- and long-wheelbase versions. Just don’t expect a high-performance Land Rover Defender custom-made for race track hot laps… for now.